Since I felt comfortable spending 1000 hours with Tony Hawk video games in my childhood, I earned my privilege to test the ACTON X1 E-Skateboard. Even if parts of the editorial staff might see it differently – it doesn’t matter. Already after my first test drives I can say with 100% certainty: this is my favourite gadget of the year. 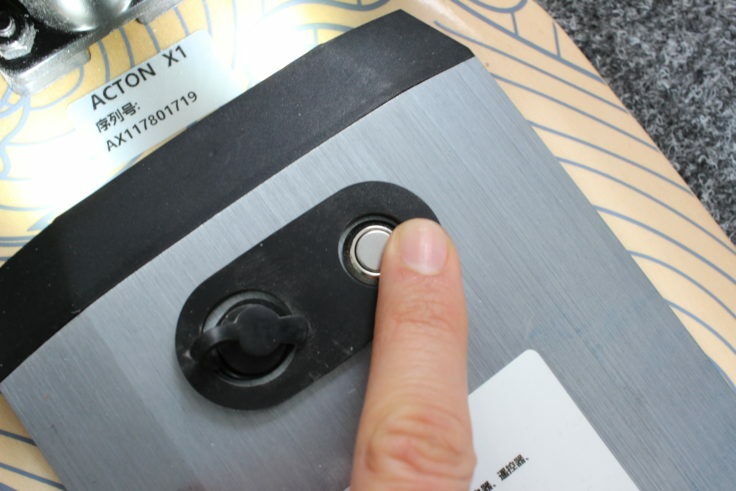 The manufacturer of this e-skateboard is ACTON, who officially distribute it under the name ACTON Blink S-R. 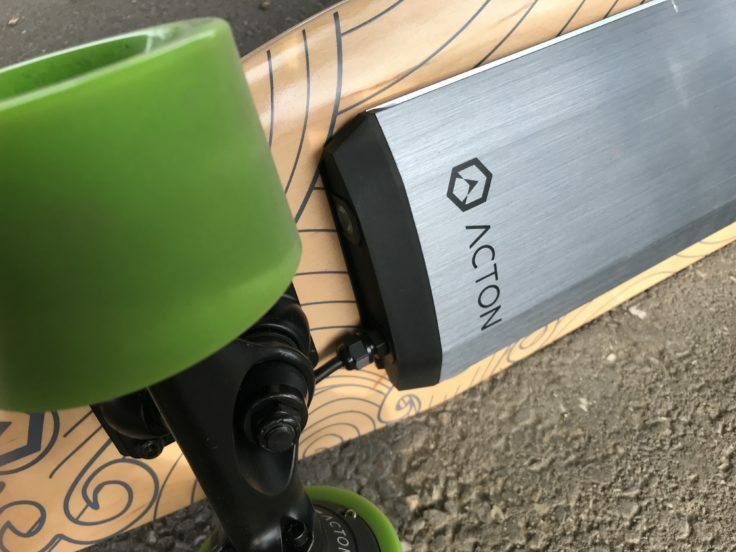 In China it is marketed under the name ACTON X1. 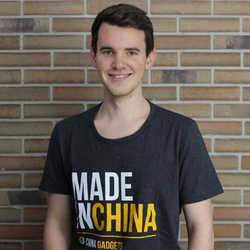 However, Xiaomi distributes it via its own platform youpin, which is why it is sometimes associated with the name Xiaomi in some shops. The ACTON does not look like a classic skateboard. A typical skateboard offers nose and tail in a round shape, the ACTON works here with square ends. This shape is rather unusual for longboards. In general one could classify the ACTON as a “cruiser“, with dimensions of 7.87 inches x 27.75 inches it is relatively small. But we don’t have to get lost in formalities here. Optically the skateboard sets accents. If you look at the deck from a bird’s eye view, you can see that the manufacturer has divided the griptape into a black and a grey area. Apart from optical reasons, this serves probably quite simply for orientation, to distinguish where nose and tail is, i.e. where front and back is. This can be recognized by the green arrow at the front of the nose, which indicates the direction of travel. The underside of the deck is also only meant for the eye on skateboards and longboards. 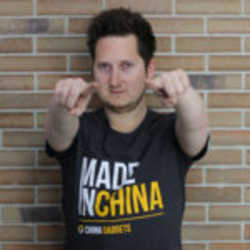 With the Xiaomi ACTON, the technology is revealed here. Engine and battery are located between the two axles. 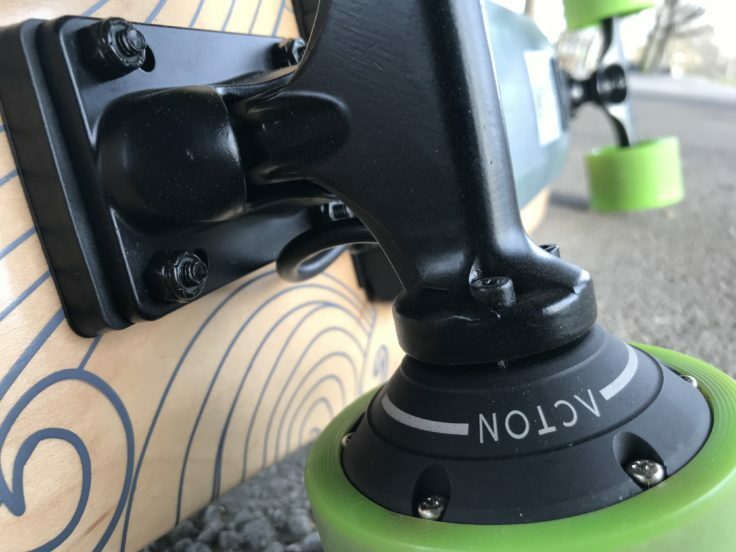 The aluminium frame gives the maple wood additional stability and ensures that women and men up to 100 kg can try their luck on the electric skateboard. Of course, the motor and battery also make for a rather proud weight. With a dead weight of 5 kg it is heavier than normal skateboards, but still easy to transport. Another difference, of course, are the wheels. 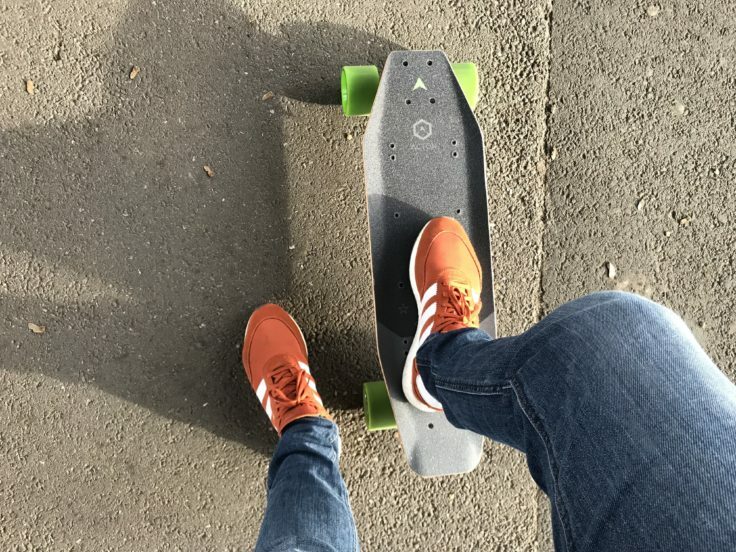 While a skateboard offers wheels with a diameter of about 50 mm, the wheels of this electric skateboard with a diameter of 83 mm are much bigger. As you know from a longboard, the wheels are correspondingly wider. This has the advantage that there are no problems with collisions with small stones on the track, and the board rolls much longer. Both makes a lot of sense with the ACTON. The neon green tires are made of hard rubber, so they give way a bit, but are still relatively hard. Due to the good ball bearing they still roll well on their own. This is only true for three of the four rollers, because the engine is attached to the rear left roller. Even though, and here I want to be honest, my skateboard past is now a few years ago, I don’t think that the ACTON has to hide from more expensive e-skateboards when it comes to processing. The e-skateboard is robust, carries one person weighing up to 100 kg and weighs 5 kg itself. The 7 layers of maple wood make a very solid board. This is how the ACTON switches on, by the way. You can criticize that the skateboard doesn’t look like a “one piece”, but it also looks like a normal skateboard with motor and battery screwed on afterwards. This makes it look as if you can simply remove it, which is not the case. All this makes a very good impression on me and the functionality hasn’t changed even after a few kilometers. 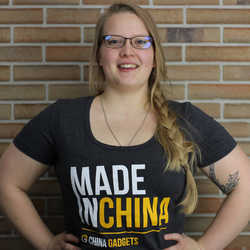 The above mentioned technology makes the big difference between the Xiaomi ACTON and an ordinary longboard. 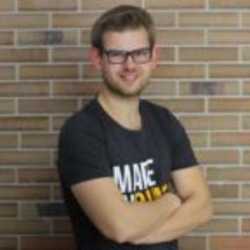 The engine is a 500W engine that catapults the skateboard to 22 kilometers per hour. Inclines of maximum 15° are possible. The maximum speed is divided into three different speed modes: Beginner, Normal & Pro. If this is really your first time on a skateboard, the beginner mode is recommended, because you can significantly reduce the acceleration and not quite reach the top speed. Once you’ve developed a riding feeling, you can quickly switch to normal mode, which I think is more than enough. I couldn’t see any real added value from the Pro mode during my test drives. Apropos driving feeling: that’s very good for me on the ACTON e-skateboard. I can’t write it any other way, that riding is just a lot of fun! Of course it doesn’t feel any different than riding a longboard, but since you accelerate with the remote in your hand, you have more time and focus on shifting your weight. I like that a lot, but others from the office didn’t dare to go on the skateboard. In comparison, an electric scooter like the Ninebot ES1/2 is of course easier to steer because you have the extra handlebar. 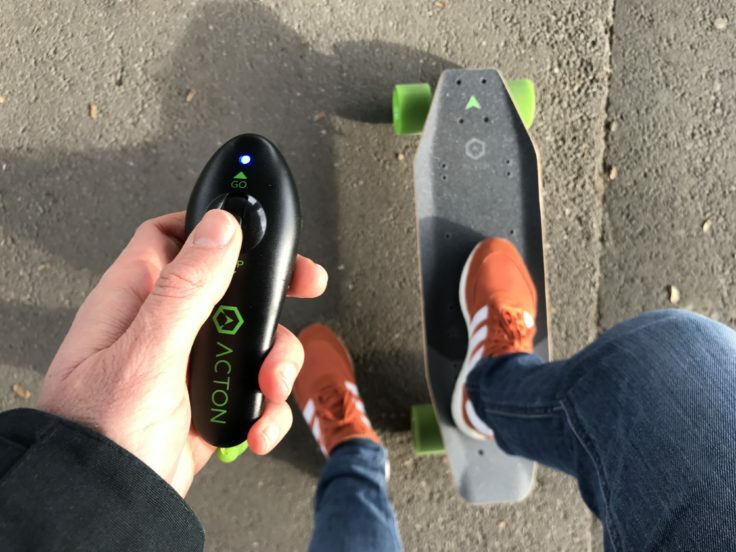 Instead of a handlebar, the ACTON E-Skateboard has a remote control in your hand, which fits very well to the skateboard. Unfortunately, the most inexpensive option was chosen for the workmanship; it doesn’t feel really high quality. Here I might have wished for some rubber or silicone to improve the grip. But that doesn’t change the functionality, which is impeccable but also limited. Because we can only switch it on or off, regulate the speed and change the direction of travel. I don’t think that changing the direction of travel is an optimal solution, because the simple sliding mechanism can make you accidentally drive in the wrong direction. The speed, however, can be set very comfortably, the slider jumps back into the middle again and again. With the Xiaomi ACTON you can also drive at night, because the metal frame is equipped with LEDs all around. So you can be seen from the front, from the back, as well as from the sides. But my problem is that the side LEDs are always switched on, no matter if at night or in daylight. The front and rear LEDs can be switched on and off in the app. There are red LEDs in the back, white LEDs in the front. The side LEDs attract some attention if you leave your private way for a short time. But how long can you cruise around with the Xiaomi ACTON? Relatively long! The manufacturer states a maximum range of 12 km, but of course it always depends on the weight of the driver. The battery is an 80Wh Li-On battery. If you are on the road, the battery goes empty, you have to go to a power outlet and charge the board completely within an hour. You can also simply remove the battery, so you can also use the ACTON as a classic longboard. A skateboard with app? 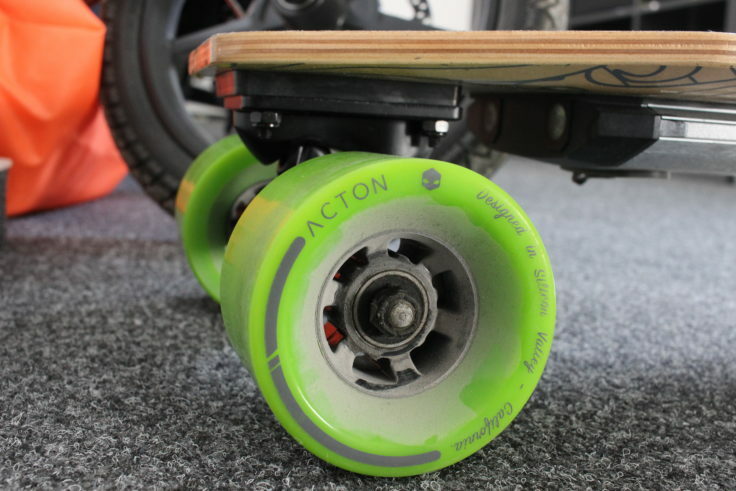 What sounds like back to the future becomes reality with the ACTON X1. However, this is not so much for control as for overview. Because with the ACTON App (Download: Android | iOS) you can see the battery status of the skateboard in percent, the current speed and the kilometers driven so far. The battery level is helpful, but you don’t necessarily have to control the current speed. You can only set the mode and the LEDs. However, these are settings that may always stay the same anyway, at least one mode is the one that you will settle into in the long run. Otherwise you can change the name of the board and add a photo. 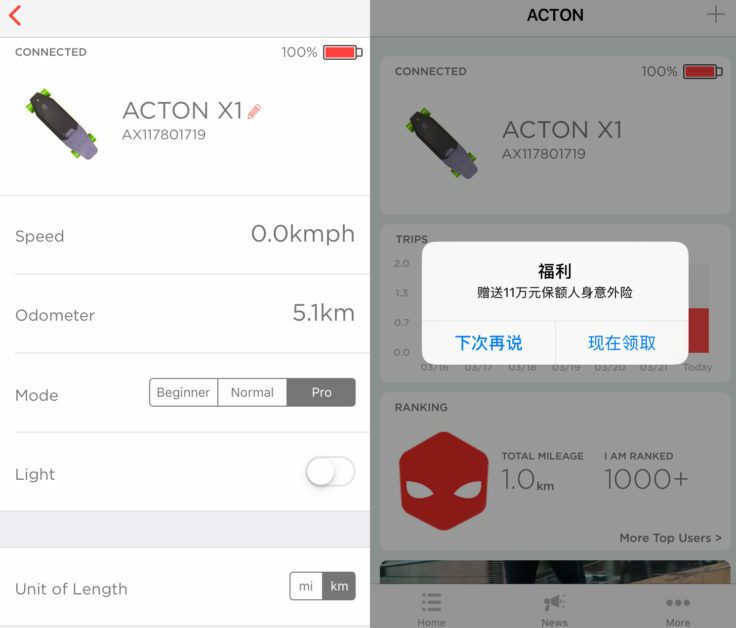 The app also gives you the choice to create an ACTON account, but you can also use the board in guest mode without restrictions. With the account there are several community services like a ranking, technical support or a referral program. 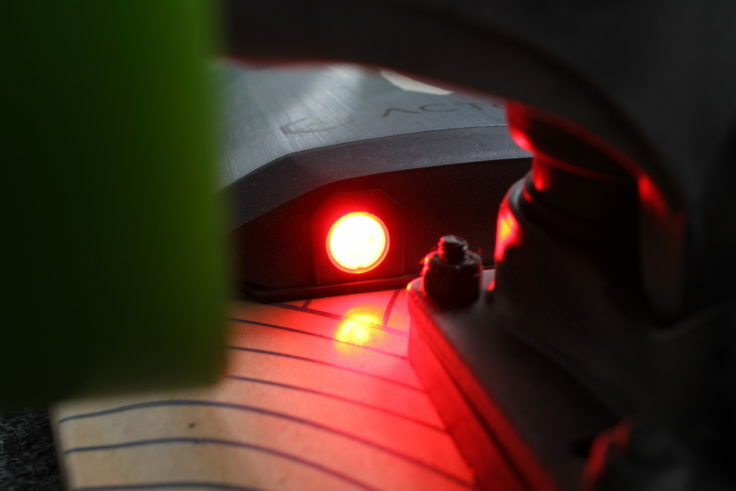 As mentioned at the beginning: the ACTON X1 / Blink S-R is my favourite gadget I ever wanted to test. But that’s simply because I’ve wanted a skateboard like this since I first stood on a board. Apart from that, I’m also very fond of the product itself, I like the visual and technical implementation and the additional app control is very successful. One can criticize the somewhat inferior workmanship of the remote control and the relatively high dead weight of the skateboard. 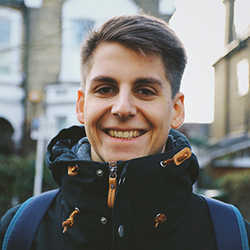 The current market leaders are probably Boosted Boards, which produce the strongest electric skateboards in terms of quality, but with almost $2000 they also have to pay a lot! For around $300 you get a successful e-skateboard that really makes you want to skate. 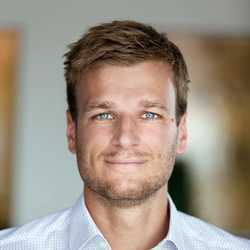 I’m missing some comparison values, so I can’t and don’t want to present the ACTON as the best solution for this price and just wanted to give you my impressions. In addition, we will extend the test in the long run, as soon as we can drive a few more kilometers (in one piece) with it! 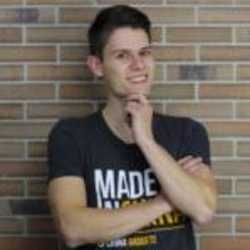 How do you feel about electric skateboards? Would you dare to drive around with it or rather take an E-Scooter?